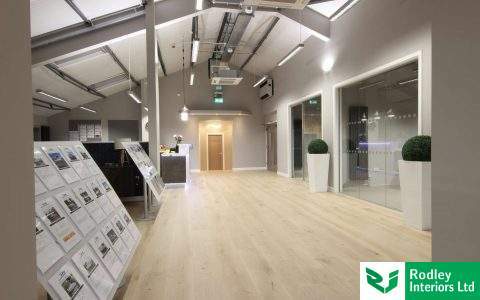 A complete one-stop-shop for any office refurbishment, whatever the size. We’ll fitout your office including partitioning, decorating, plumbing & electrical works, bespoke joinery, office kitchens, and more! We supply and install a wide range of partitioning systems for any office environment. 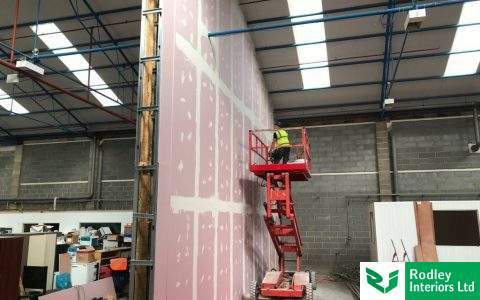 If you need great fire protection, acoustic performance and sound proofing try one of our 100mm systems. For a modern, contemporary look and light airy offices our range of full height frameless glass partitions are ideal. They allow the maximum amount of natural light through and can have dramatic colour films applied to compliment your Corporate Identity. From fitting out a brand new office building to refurbishing part of your current workspace, we offer a complete range of services. We can assist with moving offices, use space planning to maximise the floor-space and design your new interior. All the products and services we provide are individually designed & tailored to our clients specific needs and budget requirements. Our 20+ years of expertise & product knowledge allows us to provide you with the most cost effective solutions to maximise the use of space, equipment & facilities. We’re active throughout the UK with particular attention to the Yorkshire, Lancashire & Midlands regions. We have an extensive showcase of past projects which give an in-depth look at the varied work we do and display our office designs, partitioning installations and detailed finishes. We have also built up a comprehensive photo gallery. Nearly all photos on this site are our own, from refurbishment projects we've completed. This shows you some of the systems available and the opportunity to see the type of work we carry out and the high quality we achieve. Our top 3 glass partitioning projects…Who’s made the list?